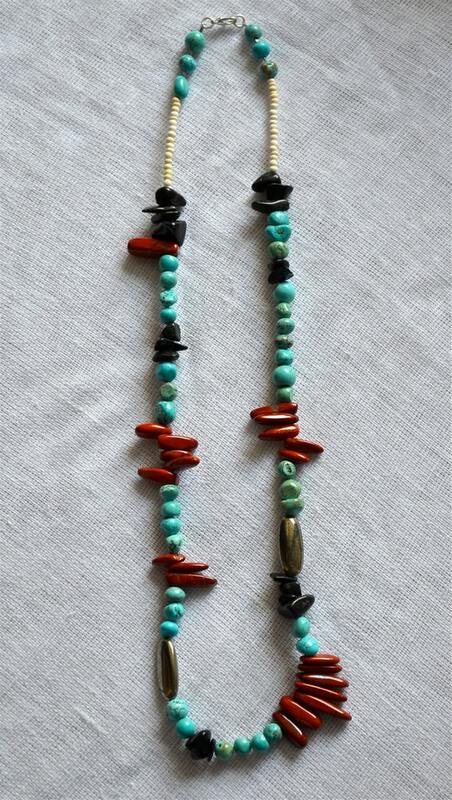 This Bold Necklace was made of Red Jasper, Silver Pyrite, Black Stone, and Turquoise Magnesite. Coconut Heishi Beads help to finish the piece off. Wear this all year round!!! Imagine it with that black drapey sweater or that white summer dress! -This necklace measures about 26" around. -All beads vary in size and shape. -Sterling Silver Lobster clasp closure. If you have any questions, please feel free to send me a message and I will be sure to get back to you as soon as possible! !